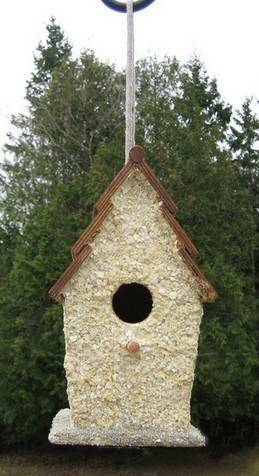 Here’s a bird house decorating idea that is suitable for both real or decorative bird houses: decoupaging with egg shells. I first used this technique to make an Eggshell Trinket Box and it worked so well, and looks so great after several years, that I knew it would work well on a larger project like this one. I hung the eggshell bird house in a crab apple tree and the chickadees were checking it out within days. I’m hoping a family will move in soon. If you’re planning to make the wooden structure yourself, see Build the Right Bird House, for the recommended dimensions of nesting boxes to attract different varieties of birds. To make a supply of broken egg shells, first place clean, dried egg shells into a strong ziploc bag, press fairly flat to extract excess air, then seal. Press down again on the bag to break more shells, first with your hands, then with a rolling pin, or another heavy object. Keep crushing the shells like this until they reach the desired level of coarseness. Some of mine were quite fine, but I left many larger pieces to make a rough-hewn texture. Now apply a medium coat of adhesive to the back wall of the bird house, using the putty knife to spread it evenly from under the roof eaves down to the bottom. If there is a ledge on your box, leave this area free of glue for now. One coat of adhesive and egg shells applied; note the bare spots to be filled in with a little more glue and more egg shells. The bird box may be vented under the roof eaves; if so, also leave this area free of glue to allow for adequate ventilation. Next, lay the bird house face down, in the middle of a serving tray, and pour spoonfuls of broken egg shells over the glue. Use the putty knife, or the back of the spoon, to spread the shells all over the glued surface, pressing down somewhat to get the shells to stick firmly. Some of the shells will fall off into the tray – you can use these up as you continue around the other sides. Repeat the gluing, and applying egg shells, on all four sides. At this point, look for thin areas, or areas where the shells did not adhere well. Apply a little more adhesive in these spots, pressing in more egg shells, until all four walls are adequately covered. If your bird house has a bottom ledge, apply adhesive to the top areas, following by a sprinkling of more egg shells or colored sand. You could also bed in small stones, pebbles or other decorations at this point. Set the bird house aside and, following manufacturer’s instructions, let the adhesive dry (probably overnight). Run your fingers over each of the bird house walls to dislodge any loose egg shells.